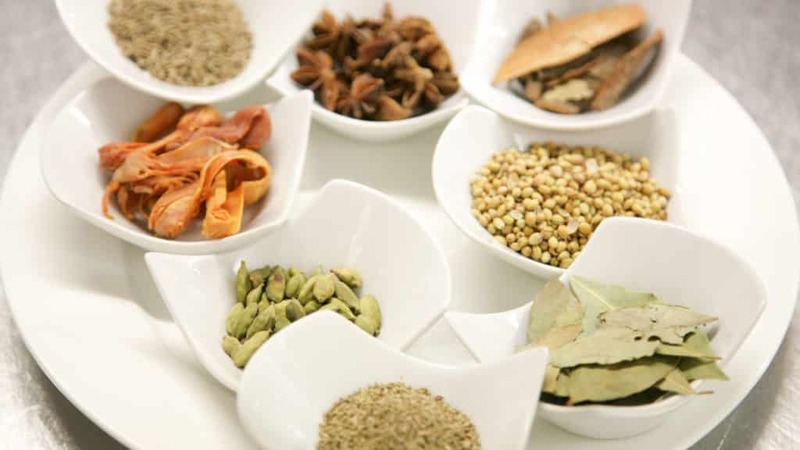 All spices have their own medicinal and healing properties. Ginger– this spice has become widely known to improve the health of your digestive tract and ease nausea. It is also a natural pain killer and anti-inflammatory. Turmeric– this spice is widely known to treat heartburn, arthritis, bloating, gas, and stomach pains. The active ingredient in turmeric is curcumin. It is also known to help reduce certain cancers, fight Alzheimer’s disease, and has been used a lot in Chinese medicines to help with depression. Learn more about the health benefits of Turmeric! Garlic– this spice is widely known to boost immune systems and anti-fungal properties. It is also known to help lower LDL bad cholesterol and raise HDL good cholesterol. This means it is very powerful in preventing against heart disease. Green chillies– this spice is known for boosting immune systems and has anti-bacterial properties. They are rich in anti-oxidants which helps slow down the ageing process and reduce the risk of certain cancers. The green chillies can also help balance out sugar levels, rich in iron and vitamin E which helps promote healthy hair and skin. All the above spices also add great flavour and colour to dishes that may be bland. Fresh produce is the key aspect to Indian cuisine. Vegetable-rich diet is more beneficial when it is fresh. All dishes are made from scratch with fresh ingredients which means fewer preservatives and overall healthier food. This food diet will keep your organs healthy and vitalise your body. Using superfoods in Indian cuisine dishes, for many it will make it more enticing to eat. Chickpeas– these are often used in vegetarian dishes. They are high in fibre, protein, zinc, and folate. Adding these to a curry will add great benefits to your body. Spinach– contains high levels of anti-oxidants, vitamins, and minerals. Adding these to your diet is well worth it. Moong Dal– it contains very little calories and is rich in a source of potassium and Iron. Masoor Dal– this is great for people who suffer from bile reflux. It also improves circulation in the body. The Indian diet consists of food such as salads, dals, and curries which are made up of pulses and vegetables. A lot of the recipes do not contain calorie-rich ingredients such as cream and cheese, unlike other cuisines. The cuisine in India is known to be the fifth healthiest in the world. It has a lot of anti-inflammatory properties and can help prevent some forms of cancer. The fresh food and vibrant spices are what makes this cuisine healthy food. In recent studies by Neha Kava the Indian dietician, has proven if you eat an Indian diet you can increase your life expectancy by 25%. When eating Indian food, you will feel refreshed and ready to go. Unlike eating processed foods that may not be fresh, the sluggish feeling afterwards tells you the difference between the foods. Indian dishes have such distinct flavour and spices with just a small portion they can satisfy your taste buds quite quickly. They will help you to consume smaller portions and fewer calories. The vibrancy of the food keeps it interesting and will prevent the food to become boring and less interesting. Natural, cucumber and mint yoghurts are very often added to Indian cuisine. They are a great source of calcium and are low in fat alternative. It is also great for the digestive system as the bacteria that are present in yoghurt improve digestion. Eating them regularly can also help you from gaining excess body fat. They are also great for the prevention of insulin resistance. All traditional Indian meals include proteins, fats, carbohydrates, and fibres all of which you need to maintain a healthy balanced diet. Most Indian sauces that are made are vegetable based such as Sag aloo which is spinach and Gobhi Aloo which is cauliflower with potatoes. These make for a better and healthy choice of sauce. In recent studies, it has shown that turmeric can prevent Alzheimer’s disease from progressing. The spice will naturally block the formation of beta-amyloid which causes cerebral malfunction. An interesting fact is people living in India are 4.4 times less likely to develop this disease than those who live elsewhere. That is why turmeric is widely used in Indian cuisine. Adding an Indian diet into your daily routine you are sure to meet great benefits of this. The food is richer in taste, texture and is satisfying to the taste buds and offers a variety of delicious dishes. It really is worth a try. Find out what the 10 Best Indian food dishes are here!